This was the beginning of the conversation I imagined between an excited new auto repair shop member of Auto Training Institute’s Re-engineering Program and his spouse. Likely, this $45,000.00 program would be one of the three largest purchases this family had made. It may even be more than this auto shop owner takes home in a year. Even if your sales aren’t as large, or the stakes as high, it’s critical that you prepare your new member for the conversations they’re going to be having with family and friends after joining. I first learned this secret as an Amway distributor. It was really disappointing to show a prospect the plan, see the excitement in his eyes, and hear back from him the next day that his wife told him he couldn’t do it. Sure, call him a whip if you want, but your member’s wife has leverage you don’t. It’s the same with employees. You sell a program to a business owner and he gets excited and tells his employees about it. I guarantee that your brand new member isn’t as good at selling your program to his employees as you were in selling your program to him. Especially when you consider that the motivations are different. In your sales material to the business owner, you likely promoted the money, lifestyle, and peace of mind they’d receive when they implemented your program. None of these are attractive to your business owner’s employees. As a membership marketer, you’ve got to prepare your new members for the likely reactions of the people around them and give them the tools they need to make their friends/family/employees as excited about your program as they are. I’ll soon have some exciting examples to show you from an SASS client who is creating training videos for each of the function areas that are interacting with his system. This way, the accountant, the marketing manager, the operations manager, and the CEO each receive a message that gives them the reasons this system will benefit them, as well as how they can begin to get the most out of the new system. In my work with the Automotive Training Institute, it was clear that repair shop owners who attended training succeeded in the program at a much higher rate than those who chose not to attend. What’s more, they retained their memberships for a lot longer. Thus, I focused the member welcome package on helping the new member attend his first training class. Here’s a panel from the information. It’s directed toward the shop owner’s spouse. Imagine what you would do if your spouse came home after spending $45,000.00, then told you about the three trips to Baltimore. How would you feel? Confused? Angry? 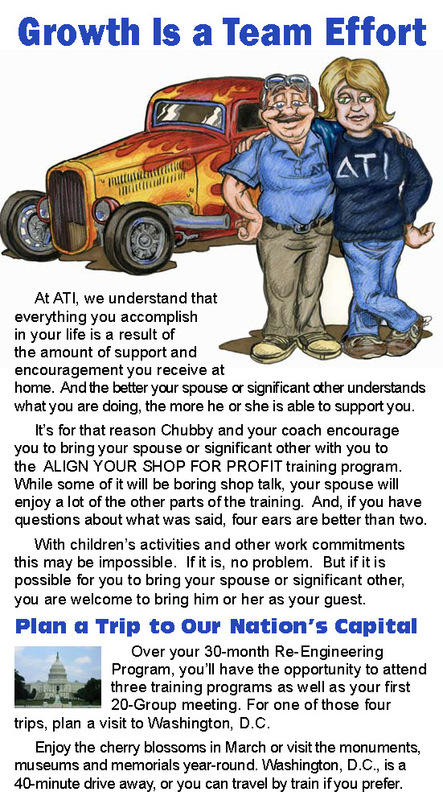 Now read the copy on the brochure It’s directed at making the spouse feel comfortable, whether they’re attending training or staying home to “man the fort” so the shop owner can go. An effective new member welcome is not only for your member. It’s also intended to equip your new member with information so they can handle those around them. Managing the influencers in your member’s life is a key factor in turning member churn into long-term member retention. Hi Robert. Where is the panel aimed at the shop owner’s wife? I only see the original and a video about running the Boston Marathon. (Well done, by the way!) Thanks for all you do!